In the spirit of giving, six chick-lit authors present a charming collection of seasonal shorts sure to inspire holiday cheer, plus love and hope throughout the year, with all proceeds donated to Rocking the Road for a Cure! Every penny of the royalties is going to Breast Cancer Charity, Rocking the Road to a Cure. Rocking the Road to a Cure is dedicated to improving the quality of life of people undergoing the often energy-depleting and emotionally draining treatments for breast cancer. The name comes from their founder and President, Dawn Frey, a musician, who learned through personal experience that “it takes a village” to get through the diagnosis and treatment of breast cancer, and not every individual has the support network they need. Rocking The Road For A Cure provides free, in-home housekeeping, health and wellness services to restore strength and confidence, and to rebuild spiritual, emotional and physical well-being. So, when you settle back and relax to enjoy reading Merry Chick Lit, please know that you have helped us help a breast cancer patient to also settle back and relax…and heal. You can get your copy on Amazon. Not only do you support a great cause, but you get a great read too! 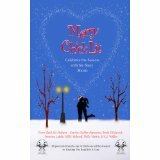 This entry was posted in Guest posts and tagged breast cancer charity, Merry chick lit. Bookmark the permalink.